Mother Teresa Award-winner, National Award-winner and four-time Filmfare Award-winner Padmashri Anuradha Paudwal, added another feather in her overcrowded cap recently when she was honoured with a doctorate by the UNO as the Cultural Ambassador of devotional musicat the UK Houses of Parliament for not just her outstanding contribution to music, but for her charitable initiatives as well. The function was by the Members of Parliament from the lndo-British All Party Parliamentary Group, Houses of Parliament. 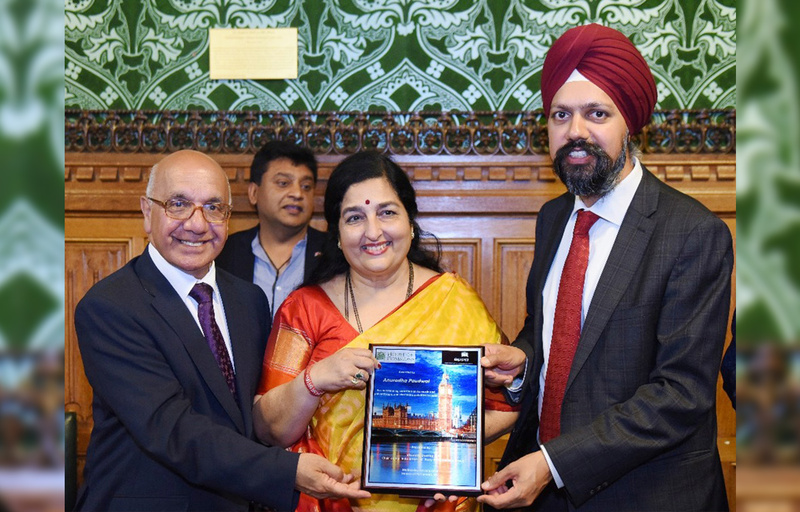 Also in attendance were Politicians, Journalists from Asian Radio, TV and print media, together with leading representatives of the Indian Music Industry in the UK. Anuradha Paudwal, who has to her credit, over 1500 songs in several Indian languages over a period of four and half decades is humility personified when asked about her feelings, “Awards and acknowledgements matter to an artiste. It is the love of the people that goads us to grow at every stage. My felicitation is at a place that is seeped in history, is over 800 years old and is considered the Mother of all Parliaments. I felt blessed with the love of the people, and appreciation from unknown quarters. It is touching to know your efforts have reached corners of the world! Currently, besides her world tour, where she has travelled to the UK and Australia thus far, and travelling to Sri Lanka and the United States of America next, Anuradha Paudwal is working on a major devotional project. Incidentally, Anuradha Paudwal is also involved in helping solve issues of malnutrition and electricity in Maharashtra’s Nandurbar district as well. Surely something that other celebrities need to follow! Harshvardhan Kapoor starrer Bhavesh Joshi Superhero screened at the Neuchatel Film Festival !